§ Whisk cream, egg yolks, sugar and salt in a heavy bottomed medium saucepan over medium heat. Cook, stirring constantly with heatproof spatula until the mixture is thick enough to coat the spatula and almost boiling 5 to 6 minutes. § Immediately, pour the cream mixture over the chocolate in a bowl. Whisk until completely melted. 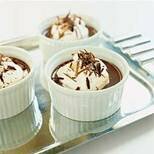 § Divide the chocolate mixture among ramekins or small cups and refrigerate until set (about 2 hours). § Whip 1 cup Heavy Cream, Espresso & Powdered Sugar with Mixer until fluffy and stiff peaks form. § When ready to serve top Pot De Crème with Espresso Whipped Cream. § Garnish lightly with shaved chocolate.